First, text ATC to 80100 to win prizes plus get $10 donated to the trail conservancy. Click here for details. Second, there’s the “I am the Appalachian Trail” video contest which is a fun concept. Thanks to Carol White Llewellyn (The Finger Lakes Travel Maven) for sharing these. She found them while she was researching a visit to the Appalachian Trail. Looking at a pair of hiking boots is not normally what sets someone to feeling old. But, I can’t help it. My life is measured by hiking boots and their progression in technology. As with other advances (notably electronics! ), the hiking boots of today are a world away from the hiking boots of my young adulthood. Montrail Moraine hiking boots before hiking the AT. In 1995 I began preparations to thru-hike the Appalachian Trail. The prep included shopping for, selecting, and breaking in a new pair of hiking boots. 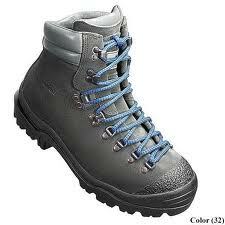 I selected a state-of the-art all leather, mid-calf hiking boot called Moraine from Montrail. These were rugged behemoths that weighed 4 pounds and surrounded your foot in protective leather. The footbed was flat, requiring an insert to provide a minimum of cushioning and arch support. Months before hitting the trail I began wearing my boots; first around the house for short time intervals. Montrail Moraine hiking boots after hiking the AT. Then for forays outside, gradually building up the time span and letting the boots somewhat conform to my feet as they were softened by sweat. Some hikers would fill their boots with water and others would even wear them in a shower in an attempt to get the perfect fit. But, as you can imagine, water wasn’t the kindest to leather. In fact, we slathered the boots with waxy waterproofing which served to keep the water out but also proved adept at keeping sweat inside. I came to learn, in a painful way, that sweaty feet are a breeding ground for blisters. On the trail, I trashed my hiking socks and began wearing only liners. And I took frequent breaks with my boots off to air out my feet and liners. Still, my feet blistered horribly. 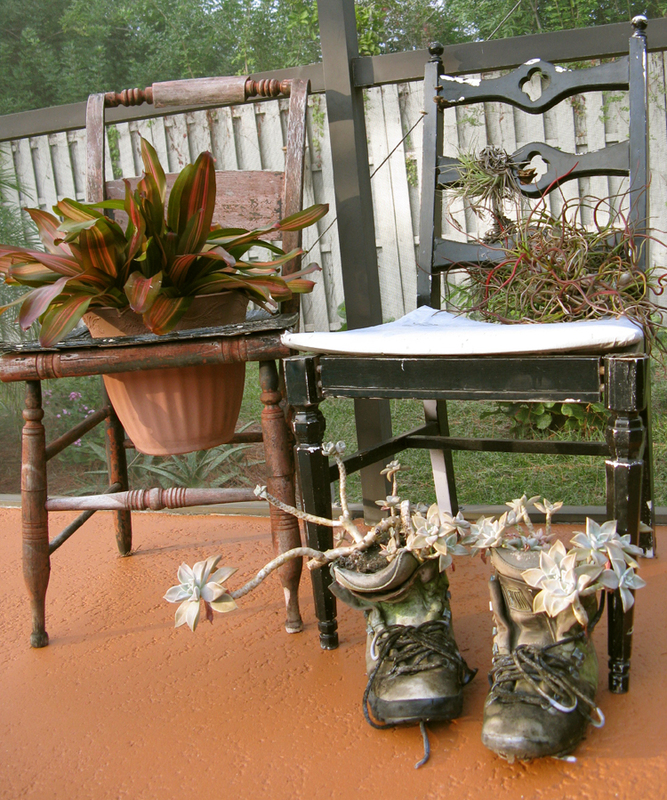 Over the years, as I hiked other long-distance trails, I tried various boots. Each was an improvement in small ways. But, one thing that irked me to no end was the impossibility of finding boots that weren’t waterproofed. For years, a boot wasn’t sold unless it sported GoreTex waterproof fabric. Fortunately, those days are long gone – and so unfortunately is my youth. I got a new pair of hiking boots recently – TevaSpheres. Hot off the development and manufacturing line, they’re the latest advance in technology, built for those of us who enjoy a variety of land-based outdoor fun that covers a diverse range of terrain. The ones I got are the TevaSphere Trail. They’re built specifically for women and offer a sturdy trail shoe, but NO waterproofing. Yipee! My happy feet can breathe. And I’m only lifting 1 pound of boot – a far cry from the 4 pound behemoths which probably weighted closed to 5 pounds once they got wet and stayed wet. Some things do get better with age. Technology advances – such as the first-of-its-kind spherical heel and pod-arch system are significant improvements for people like me with aging feet. I bet the young ones will enjoy them also. 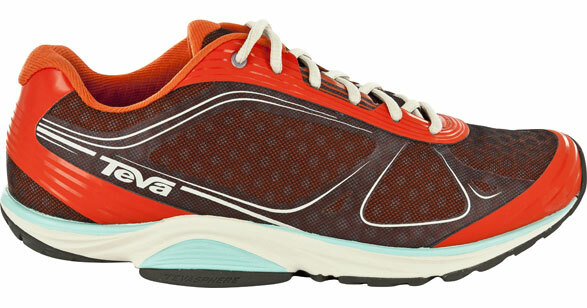 I’m looking forward to giving my new TevaSpheres a decent workout. Dreaming of Thru-Hiking the Appalachian Trail? If anyone is thinking of some day thru-hiking the Appalachian Trail, there’s an organization of trail hiking experts who are a wealth of information called ALDHA – Appalachian Long Distance Hiking Association. Once per year in the fall they hold a Gathering. The location rotates between spots in NH, PA, and WV each year, but if you can go to one you’ll find a wealth of programs and camaraderie that will inspire you to move on your dream and equip you with valuable knowledge. Click here for the ALDHA brochure. I had a plan. But, like many plans made in the warmth of my living room, this one failed its first field test. 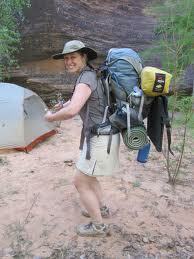 I was backpacking for 6 months, hiking north along the Appalachian Trail with my husband Rich. After 2 months on the trail, we hiked along one sunny day through Virginia, traversing the side of a hill in lush spring foliage. Rich was in front when we heard the sound. Having never heard it live before, I was surprised at how unmistakable the rattle of a rattlesnake was. It stopped me dead in my tracks with instant recognition. I looked to the right and there, slightly uphill and about 3 feet away, was a coiled rattlesnake, staring at me eye to eye and loudly making his displeasure known. Rich had already passed, but the snake blocked my progress along the trail. 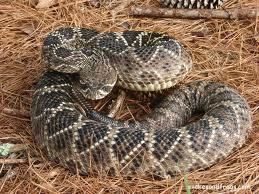 My plan was that if I saw a rattlesnake I’d simply hike off the trail & give it a wide berth. I surveyed my surroundings – the ground was obscured in thick foliage a foot deep. What if my rattler had friends nearby? Was 3 feet within their striking range? I could hear my heart pounding in my chest and Rich getting impatient, calling for me to ignore the rattlesnake & hike on. Yeah, right. I waited patiently. Minutes passed; many minutes according to Rich. Eventually the rattlesnake lost interest in me, lowered his head and began side winding uphill. I chose that moment to bolt down the trail, running as fast as my blistered feet could carry me, backpack bouncing on my back. Rich just laughed.